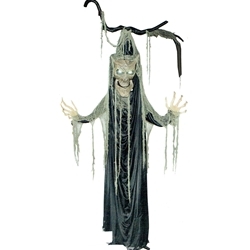 This animated tree creates a superior spooky effect when used in your Halloween decoration, haunted house, or graveyard scene. The animated tree with lights and sound features light-up eyes, sound, and a wooden face with a moving mouth. The animated tree with lights and sound Halloween decoration is colored as pictured. Decoration measures 79” tall.